If part of your daily life is dealing with pieces and blocks of wood, then you need the right saw blade to make your reciprocating saw versatile and powerful. With such a saw blade as part of your woodcutting arsenal, you can cut through wood easily. Also, some blades even have the right level of sharpness to cut through fiberglass, masonry, and even metal. If you choose a low quality reciprocating saw blade, then you're reciprocating saw is as good as a paperweight. Low-quality blades won't be able to make precision cuts, and they will have a difficult time in cutting even soft types of wood. What happens next is that your pieces of wood (or other materials) won't have the necessary smoothness and accuracy. The result for this is that you're going to make extra efforts to fix the damage that has been done. Do not underestimate the power of a high-quality blade for your reciprocating saw. Albeit some of the top-of-the-line reciprocating blades might be more expensive than what you would normally purchase, these can last longer, and they can cut better. The importance of having high quality, durable, and sharp blades for your reciprocating saw could not be stressed enough if your profession deals with wood on a daily basis. If you find it to be too much of a challenge to search for high-quality blades on the market for your reciprocating saw, then we've got you covered. The information you're seeking is already right here in this guide to help you look for the best reciprocating saw blades on the market. I use my reciprocating saw every-single-day as it is part of my job. Therefore, I rely on it a lot. I didn't see through it at first, but the time it took for me to cut a single piece of wood with it was increasing. I only noticed it when a colleague asked me why was it taking so long for me to cut wood. Then I realized my blades need to be replaced. They now have chips, dents, and bends on different areas. Simply speaking, they're not at the condition that I wanted them to be. But the thing about this dilemma is that I bought these blades not too long ago. Well, they were on sale, and they were dirt cheap. I guess you could say I got what I paid for. Nonetheless, I didn't give up, so I decided to pursue higher quality reciprocating blades this time around. It was then I stumbled upon a set of blades that seem to make the cut (no pun intended). The blades are from a well-known brand, and I was right about the price being a bit too expensive than the dirt cheap blades that I got. My only wish is that I wasn't so stingy in spending more so that I don't have to deal with low quality reciprocating blades. Otherwise, if I did stick with my old blades, who knows what would happen to my wooden projects. I might even cause delays because I became slow with my tasks (yikes!). It is no question that the market is filled with many reciprocating blades. Searching for the right one can be a challenging endeavor. However, there are some that do stand out above from the rest, like the SKIL 94100-05 Pruning Reciprocating Saw Blades. These blades are made for extremely fast cutting action. You can cut pieces of wood and other materials with much haste. It is also made of high-carbon steel to ensure durability and precision cutting. The blades in this set (there are five pieces in the standard packaging), and each of them has a fleam ground design. These models are made for cutting with both forward and reverse strokes. They can even be used for pruning. Although the Bosch RP125 Wood Cutting Reciprocating Saw Blades doesn't come out on top, they still do come at a pretty close second. These blades are made with a 5-inch tilt angle to deliver faster cuts than the traditional reciprocating blade design. These Wood blades are color-coded with gray to identify them from the rest of your woodworking tools easily. The DEWALT DW4856 Metal/Woodcutting Reciprocating Saw Blade Set, are made with high-quality metal, and they can easily cut through wood and metal. Each of the pieces in the set is made with a different teeth design, so you have a better range of options as opposed to acquiring a set with the same type of blades. A reliable set of reciprocating blades is designed for specific woodworking tasks. A worker wouldn't use the same blade design on all types of wood. As such, sets of different types of blades are required for the serious woodworker. If you only have one set or even just one blade in your toolbox, then you're not going to get very far for all of your wooden projects. Think about this - it's like cutting a piece of thick steak when you only have a bread knife in your kitchen. Even though it is still technically a knife, it's not going to be as sharp as an actual steak knife. As such, you're going to have a rough time in dealing with the piece of meat. In a similar sense, if you have only one reciprocating blade, and it is meant for only soft types of wood, you're going to be using your reciprocating saw a lot just to cut one piece of hardwood. Therefore, multiple sets of durable, sharp, and reliable reciprocating blades are a must if you're serious about getting your wooden projects done with haste and accuracy. For the most part, reciprocating saw blades are usually universal unlike jointer knives wherein you must know the model of the wood jointer first before you purchase any model. In the case of reciprocating saw blades, its width and thickness determine its stability. When you're going to utilize these blades for casual use, then look for a blade's thickness that is about 0.035-inches. Otherwise, if you're planning to use the blades for heavy-duty operations, then look for models that have a thickness of 0.05-inches so that it doesn't wobble or bend. Reciprocating saw blades could be found on the market, and there are different types of material available. The material will determine the suitability of how they can be used. The most common material is carbon steel, whereas the most inexpensive are known to be made out of steel. Steel reciprocating blades can be durable and flexible at the same time, so they can bend but won't break. Another factor to consider when looking for reliable reciprocating saw blades is the number of teeth. It is even known as one of the most defining features of the saw blade. With more teeth, it will mean it can create a smoother cut as opposed to blades with a fewer number of teeth. Because reciprocating saw blades are available on the market with varying lengths, just counting the number of teeth has little meaning if you don't consider the TPI. The TPI on reciprocating saw blades is usually found between three to 24. When looking for proper blades for your reciprocating saw, look for a blade that has at least three teeth in contact with the surface of the material that you're going to cut. 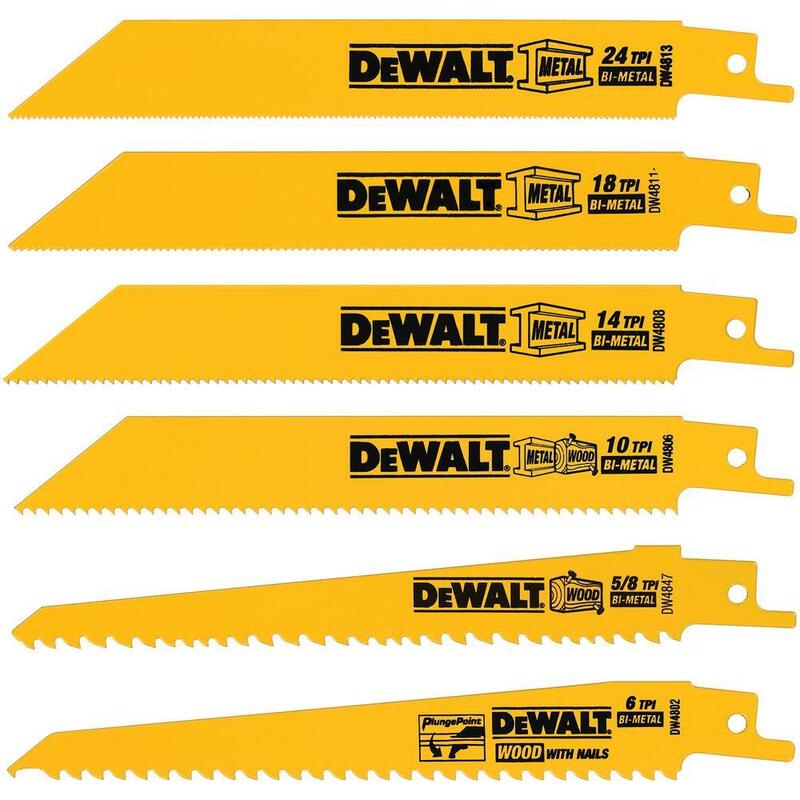 The DEWALT DW4856 Metal/Woodcutting Reciprocating Saw Blade Set are all made out of metal. The set provides users with a selection of blades to use their reciprocating saw for common applications. Each blade in the set is also compatible with all reciprocating saw brands, and they are great to be used for cutting wood, plastic, drywall, and even metal. The set in the DEWALT DE4856 contains six blades, and they have a Raker tooth design that will sit on the contact area nicely to make for a faster cutting action as compared to the traditional reciprocating blade design. The blades in the set are the following: DW4802 6-inch 6-TPI taper-back blade, DW4808 6-inch 14-TPI straight-back blade, DW4813 6-inch 24-TPI straight-back blade, DW4847 6-inch 5/8-TPI taper-back blade, DW4811 6-inch 18-TPI straight-back blade, DW4806 6-inch 10-TPI straight-back blade. Since these blades are made for casual use, they can't handle heavy-duty usage. As such, those who have woodworking professions wherein using the reciprocating saw is a daily task; then you might want to look elsewhere. Each of the blades found in the DEWALT DE4856 has excellent cutting prowess that it can be used to cut other materials other than wood. It can cut drywall, plastic, and even metal. Furthermore, since each of the blades have a different TPI than the other, then you already have a good number of options to start cutting away certain materials without having to go back-and-forth to the hardware store to purchase more blades. The blades in this set are made for casual use, which means they might not last if they're constantly used. Nonetheless, they are not bad for a set of blades made for non-daily woodworking tasks. If used constantly, then they might break earlier than expected. 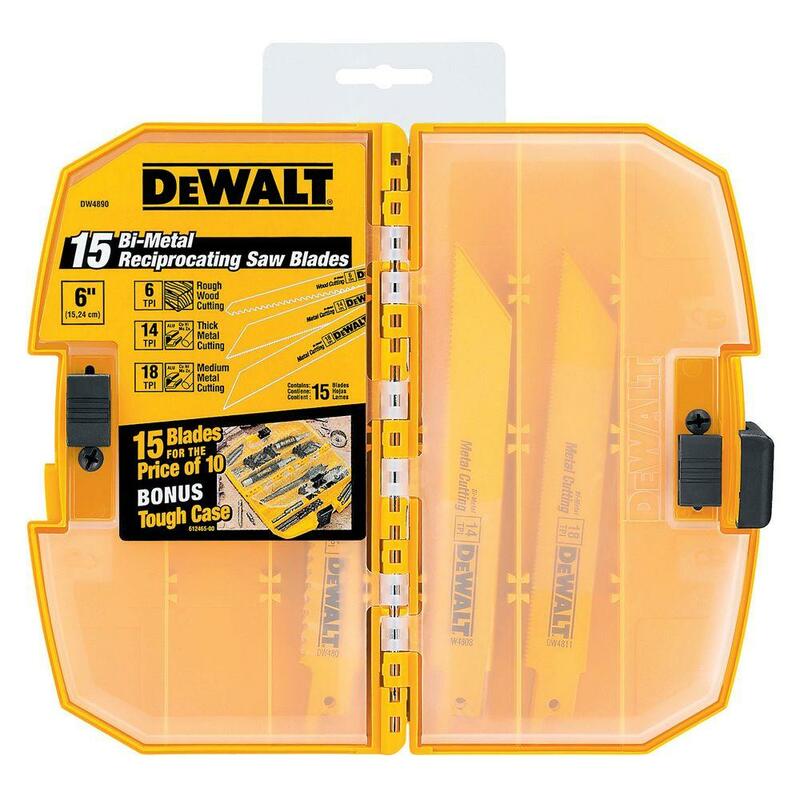 The DEWALT DW4856 Metal/Woodcutting Reciprocating Saw Blade Set is an excellent 6-piece blade set for woodworkers who are just starting out in using their reciprocating saw. Each of the blades is made for casual use or beginners. As such, these variants are not made for heavy-duty use. If you're profession demands you to cut wood using a reciprocating saw on a daily basis, then it might be your best interest to look somewhere else. As such, they do not have the best quality, but you'll already know that fact right from the onset. The standard packaging also includes a plastic case so you can bring the set along with you if needed and without any fuss. The DEWALT DW4890 Bi-Metal Reciprocating Saw Blade Set offers different blades in a single package. All of which are neatly stored inside a tough case. The case itself can expand to hold 6-inch blades. It is also designed to fit certain power tools. As for the reciprocating saw blades themselves, they are made with 8% cobalt, reinforced teeth. The blades are also quite flexible but won't break, even with moderate-to-heavy use. Its flexible body also denotes above average durability, as well as dependability. The package holds five 6 TPI wood blades, five 18 TPI metal blades, and 14 TPI metal blades. All of which grants users versatility in cutting different materials, not to mention you no longer have to run to your local hardware store to purchase another set of reciprocating saw blades anytime soon as the arsenal you need might be within easy reach from this set. The blades in the DEWALT DW4890 can cut through some materials, including metal, wood, plastic, and drywall. While the blades themselves are quite durable, much can be said about the plastic storage case. The reciprocating saw blades in this set can bend, but they won't break. They can be used for light, moderate, to heavy use. They can also be used to cut a broad range of objects with your reciprocating saw, including wood, metal, plastic, and drywall. The DEWALT DW4890 Bi-Metal Reciprocating Saw Blade can produce smooth results for cuts on varying materials. However, users are still advised to use the right blade for the task at hand. Otherwise, there will be different results. To know which blade to use, there should be at least 3 TPI touching the surface of whatever it is that you're going to cut. The DEWALT DW4890 Bi-Metal Reciprocating Saw Blade Set is a nice set to have for professionals and casual users alike. It has a more than an adequate collection of usable blades for your reciprocating saw. Each of the blades is made with quality cobalt, and they are flexible as well as durable at the same time. They might bend a bit during operation, but they won't break. While it is nice to see the blades to be as durable as they should be, the package's case leaves much to be desired. It's not as tough as advertised, and it might even break if it falls off a woodworking bench. 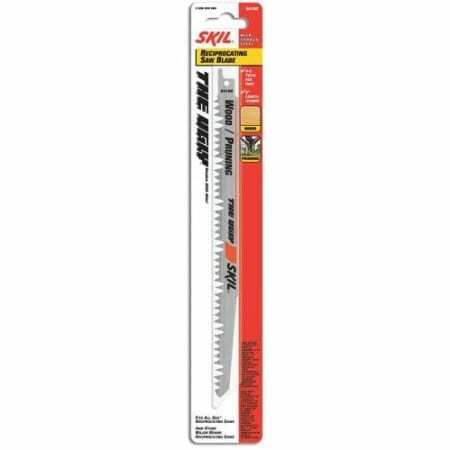 The SKIL 94100-05 Pruning Reciprocating Saw Blades are made for cutting wood, treated lumber, composition boards, and wet wood. These blades are also made to allow quick cuts as opposed to the traditional reciprocating saw blade design. Each of the blades in this 5-pack set is made with fire-hardened, high-carbon steel, and they are also precision-ground to create a razor sharp edge. All of its features, when combined, form a blade that allows itself to be placed as one of the best in performance and durability. The blades can even be used for pruning, and they have a fleam ground design to make use of both forward and reverse strokes when using them with your reciprocating saw. The set is compatible with all reciprocating saws with the SKIL brand, as well as with other major brand saws. When using these blades for cutting large branches or tree roots that are about four to six inches in diameter, it is advised to keep the reciprocating saw blade in this set to be lubricated. In doing so, cutting tree branches and roots will be an easier task to deal with as opposed to just going at the task with a blade that's not lubricated. While there are many reciprocating saw blades on the market that can cut at an adequate speed, the blades in the SKIL 94100-05 set can cut with due haste. Not only can it cut fast, but it can also produce smooth results. Make no mistake as these blades are quite sharp, and they can handle light, moderate, or heavy-duty woodcutting tasks. Just like with many other reciprocating saw blades, the SKIL 94001-05 is compatible with many reciprocating saws coming from major brands, and it includes being compatible with SKIL brand reciprocating saws. The SKIL 94100-05 Pruning Reciprocating Saw Blades brings versatility, flexibility, and ease of use into a neat package. These blades are designed to cut some materials, including plastic and many types of wood. The blades can chew through thick pieces of wood, provided that proper lubrication is followed to make the task easy to deal with. However, even though the blades in the set are durable, they can be quite thin. Therefore, they can bend when you're using them for heavy-duty operations. Nonetheless, they can be fixed with the use of the back claw of a hammer, and they'll be good as new once again. The Bosch RP125 are reciprocating saw blades that are specialized in cutting different pieces of wood. The pack contains five pieces of the same type of blade, and they come from one of the recent reciprocating saw blade lines from the brand. The production of these blades is said to have incorporated key design features, as well as patented tooth technologies to provide optimal cutting efficiency. These blades can cut fast without bending or warping while under operation. They are durable, and they can even last a pretty long while (when they are properly cared for, of course). You can select which intensity you want to use these blades, and they would most probably be able to handle the task. These reciprocating saw blades can be used for occasional, moderate, or heavy usage. It can also cut through a broad range of items, including (but not limited to) wood with nails, stainless steel, cinder blocks, cement boards, fiberglass, or even metal. These blades are flexible, but they are not prone to breaking. Also, they have a thick kerf and a tall body. These blades are made for cutting a broad variety of objects and materials. Furthermore, they can also provide smooth finishes. These Bosch reciprocating saw blades can cut through fiberglass, stainless steel, wood with nails, cinder blocks, and plastic, just to name a few. The blades in this set are both flexible and durable at the same time. They are made with high-quality carbide, and they aren't prone to breaking despite them being able to bend quite a bit during heavy operations. The Bosch RP125 are specialized wood cutting reciprocating saw blades that can be found at a fairly reasonable price point. However, it might be more than what it's worth. It contains the right levels of durability, sharpness, and flexibility that you might expect to get from a good set of saw blades. These blades also have superb cutting prowess as they can cut some soft and tough materials without much difficulty. The PORTER-CABLE PC760R Pruning Reciprocating Saw Blades are made from high carbon steel to allow for fast cutting action on soft and hardwood. These blades can also be used for pruning, and they have the durability to last a long time. The pack contains three pieces of the same blade design, and they all have 9-inch lengths with 4/5 TPI. These blades are an excellent attachment to your reciprocating saw if you're going to cut or prune limbs off of trees and branches. They can also be used for cutting off roots. However, it is advised to give them proper lubrication before you attempt to cut thick pieces of wood or tree branches as this will make the task easy to deal with. The PORTER-CABLE PC760R reciprocating and pruning saw blades are made with a high-quality steel alloy to ensure long life. You can use these blades for casual, moderate, or even heavy use. With proper care and maintenance, these blades can last a good long while before they need to be replaced. The teeth found on these blades are large enough to cut a four or five-inch branch like it was nothing. However, and as mentioned in a previous section, you might want to put an adequate amount of lubrication on the blades before you attempt to try and cut thick branches to make the job easier than anticipated. The PORTER-CABLE PC760R Pruning Reciprocating Saw Blades are excellent partners to have if you're dealing with a lot of tree branches, roots, or other wood cutting projects. They also have an inexpensive price tag, so you won't have any regrets purchasing them as they won't hurt your wallet too much. These blades are also durable, but you should still make sure that you're not going to attempt to cut tough materials like the ground as these will dull the blades real quick. I have been all over places and have searched multiple websites on the Internet to search for a reliable set of reciprocating saw blades. The blades I've purchased in the past were as unreliable as trying to cut a steak with a bread knife. One reviewer even mentioned that these blades would go "above and beyond ALL other types of pruning blades" that he has encountered. However, not all reviews are seen to be on the positive side of things. Another reviewer stated that the blades dull "too quickly." However, upon closer inspection at the other reviewers, they have attempted to cut thick and sturdy material, which is why these blades tend to dull quicker than they should. Each wood-cutting blade found in the Bosch RW66 set is color-coded with the color gray for easy identification. It helps to know which blade is in your arsenal of other reciprocating saw blades so as not to get the wrong blade affixed into your reciprocating saw. The blades have a 5-inch tilt angle to promote faster cuts, improved performance, and longer life as compared to the traditional reciprocated saw blade design and construction. The Bosch RP95 9-Inch 5 TPI Wood Cutting Reciprocating Saw Blades are used for Power Tool Accessories, and it is manufactured from Switzerland. They are color-coded with the color gray for easy identification so as not to be confused with your other reciprocated saw blades inside your tool chest. The blades have a 5-inch tilt angle to promote faster and more aggressive cuts. These are excellent blades for pruning and wood cutting. The IRWIN Tools (4935496) Reciprocating Saw Blade Set is made with a bi-metal alloy construction to promote better cutting and extra durability as opposed to the traditional saw blade construction and design. It can cut through composite materials, pipe, carbon steel, plastic, stainless steel, and wood with minimal difficulty. The package includes 11 blades, and these can do well with most common cutting operations. The Diablo Pruning Reciprocating Saw Blade 9in.L, 5 TPI, Model# DS0905FG5 contains five blades in the standard packaging, and they are made to provide excellent cutting performance for even the most extreme pruning operations. Each blade has a bi-directional tooth design to provide a more aggressive yet faster-cutting prowess as opposed to the traditional teeth design of older reciprocating saw blades. Each blade has a 9-inch length, and they can also be used to cut different types of materials. When you come across a saw blade with an "ugly" moniker, you might immediately back off from the item to look for other options. However, before you do that, know that the SKIL 94100 9-Inch "Ugly" High Carbon Steel Wood Reciprocating Saw Blade is named as such not because of its looks, but by its aggressive cutting capabilities. It is made with high-carbon steel to ensure powerful cutting and long life span. The IRWIN Tools Nail-Embedded Wood Cutting Reciprocating Saw Blade (372156) has uneven depth gullets to deliver a more efficient chip clearance as compared to the conventional saw blade design. It has 46 teeth with different depths that produces reduced noise during operations while improving overall performance. It has a bi-metal construction that promotes both durability and long life. It is also made with an electronic beam weld to make for longer-lasting teeth. The Milwaukee 48-00-1430 9-Inch Tungsten Carbide Sawzall Blades presents durability and ease of use for users. As such, beginners and veteran users of reciprocating saws would have minimal to no problem making use of the blade's proficient cutting prowess. It's made out of tungsten carbide, and it can do well when cutting tough materials. It is designed to easily cut through hardwood flooring, stainless steel, fiberglass, stone, ceramic tiles, and much more. 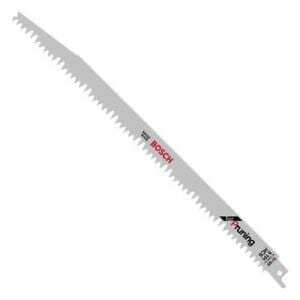 The LENOX 20572-656R 6 TPI Wood & Metal Cutting Reciprocating Saw Blade makes use of T2 technology to promote a long life. It is made out of a bi-metal construction which can stand up to the most heavy-duty of operations. The blades are made tougher, longer lasting than a conventional saw blade, and they can reduce heat and friction efficiently to help extend its lifespan. When used for plunge cutting, it can make cuts effectively and hastily with the rapid plunge tip. The Bosch RW126 12 In. 6 TPI Wood Reciprocating Saw Blade is made with fleam-ground teeth which promote excellent cuts due to its razor sharp construction. It has 6 TPI to deliver very fast cutting motions through wood, as well as with PVC plastic materials. It also has a thickness of .050-inches, which means it can stand up to many heavy-duty operations without bending or breaking. The standard packaging has five of these blades at the ready. The Freud DS0906CW Diablo 9-Inch 6-TPI Carbide-Tipped Reciprocating Saw Blade has a variable tooth design to denote faster and accurate cuts. Furthermore, it deals with cutting with less vibration as opposed to using conventional or low-quality saw blades. It can cut through nail-embedded wood efficiently, as well as with other materials. It is made out of high-performance carbide to promote long life and high-quality durability. There are many characteristics and features that can be found in different reciprocating saw blades, and it can make selecting the right one for your needs to be quite the challenging endeavor. Nonetheless, as a consumer, you have some options available in simplifying the process, such as purchasing an entire set instead of buying just one blade. When it comes to purchasing a set, you ought to consider the SKIL 94100-05 Pruning Reciprocating Saw Blades. While each of the blades in this package has the same tooth design, you won't have to worry about running back to the store should one break because you've accidentally tried to cut through very tough material. If you want to check out this reciprocating saw blade, then you can do so by clicking here.